In the networks that I run I typically try and follow the FCAPS model. The (C)onfiguration part of that is often overlooked. I have used paid and free products, and they all work fine, but I wanted something that was simple, version controlled, and fully open source. This solution uses Cisco's Embedded Event Manager (EEM) to ship configurations to the backup server, Git for version control, and Gitlist for browsing your network configurations. After this is deployed, all of your Cisco IOS devices will automatically backup their configurations after write mem or copy run start are issued from the command line. At midnight, git will commit all of the changes for that day. Then you will be able to browse version-controlled, network configurations via the Gitlist web interface. Here are some screenshots of what it will look like. To set up a server to house all of the network configurations that have been backed up, we will be using Centos 6.5. For the transport medium to ship the configurations to the server we will be using SFTP. Since SFTP is a subsystem of OpenSSH, setup is super simple. Just a vanilla install of Centos will already have SSH running. All we need to do is create a specific user account for the configuration backup process and install and configure a Git repository to store and version the configurations. Do all of the following as root by using sudo -s or su - if you are not in sudoers. Change the permissions on the new user folder. This is needed to permit Gitlist to view the Git repository. Set our Git username and email address, so when doing commits, it will show the correct user information. git config --global user.name "configbackup"
Insert the following text into the file by pressing i, then paste the text. To save the file, first press the escape key, and then :wq and the enter key to write the file and quit. /usr/bin/git commit -am"automatic nightly commit"
Gitlist is used for viewing a Git repo in a web browser. This makes it very easy to traverse your network configuration backups. Modify the .htaccess file to rewrite the base URL to /gitlist/. This is necessary if you host Gitlist somewhere other than the root (i.e. - http://host.domain.com/gitlist). Modify Apache configuration to allow the Gitlist .htaccess file to be executed. This is done by changing the AllowOveride directive to All. If you want to install your own certificate, then you need to modify the /etc/httpd/conf.d/ssl.conf file and point Apache to your certificate. I will not go into the details of this. I will just use the self-signed certificate that is installed when mod_ssl is installed. SELinux is a security measure that enforces mandatory access control (MAC) on Linux. Sometimes this will not permit processes to function properly if the labels are not set up correctly. I would highly suggest not disabling SELinux, instead, learn how to use it and fix whatever issues you may come across. That being said, if you don't want to mess around with it you can set it to permissive by modifying /etc/selinux/config and rebooting the server. 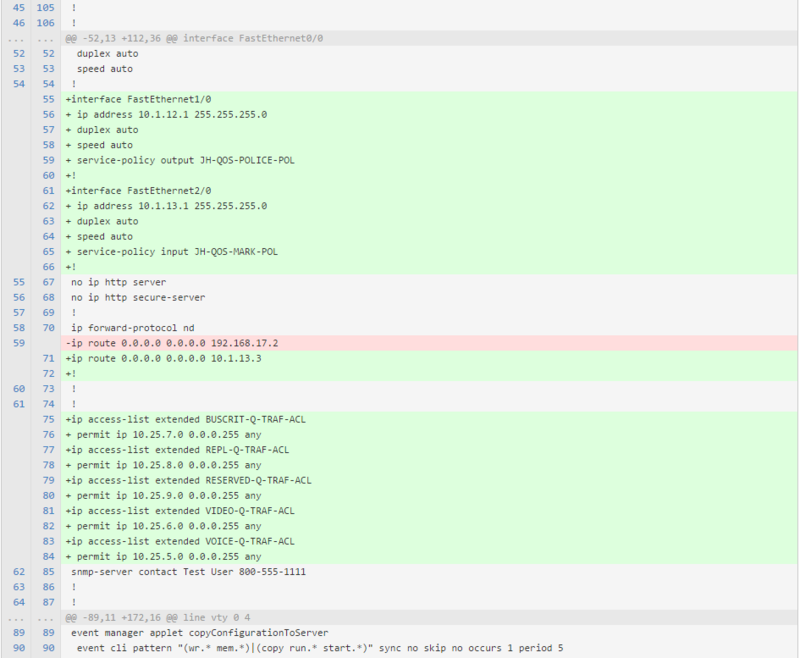 In order to make your switches and routers ship their configurations to the server, you need to install an EEM script. This script listens for write mem or copy run start and when either of these commands is run at the cli, the script will execute and copy the startup-config to the remote server via secure copy protocol (SCP). First, we need to silence all of the prompts that IOS presents us when we use the copy command. If this is not done, your EEM script will hang indefinitely. Then install the EEM script. !Silence file prompts so the EEM script does not hang waiting on user input. action 2 cli command "enable"
action 3 cli command "copy startup-config scp://configbackup:password@192.168.17.131/git_repos/config_repo/$_info_routername"
action 4 syslog msg "EEM Script copyConfigurationToServer writing configurations to remote server"